Infinite reflection with Fiend hunter out? What happens when there are two Infinite Reflections in play? Will stormtide leviathan and willbreaker work? Since the goal is to cast Stormtide Leviathan as soon as possible, you could run Choke (against other control decks), since Wilderness Reclamation stop it from hurting you very much. 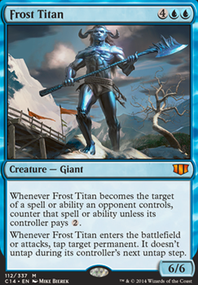 Also Quicksilver Fountain , against tron decks. 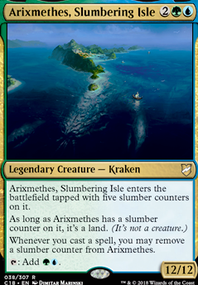 You can prevent the fountain from turning all your lands to Islands, by using two Simic Growth Chamber to bounce eachother. you could also use something that is very evasive ofcourse. like Sun Quan, Lord of Wu or Archetype of Imagination . 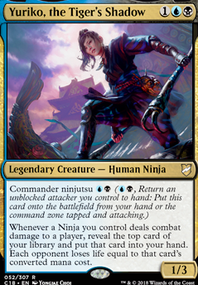 or something different like a combo with Deadeye Navigator , or counter things and make Draining Whelk really big. 99LandOTK Thanks for the suggestions! I had considered Sol Ring as it was on the list of EDH staples for ramp but I didn't think of checking for cheaper moderate/heavy play cards. I also didn't notice that Arcane Melee applied to other players. I put Blighted Cataract in just to be a more interesting land without actually looking at the mana cost, so I'll be sure to get rid of it. 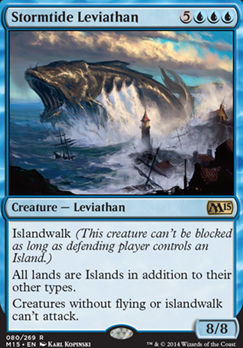 I might keep Stormtide Leviathan though, if anything else just play after a wipe (I'll look at adding cards that grant islandwalk). You have a lot of really expensive stuff (mana wise), so be careful about aggro in your playgroup since it sadly seems you'd be blown clean out of the water. 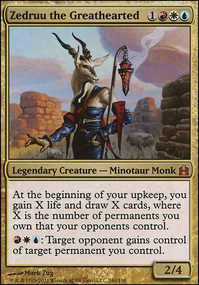 I'm not sure about what your budget is, but Sol Ring is always a nice addition to all EDH decks. 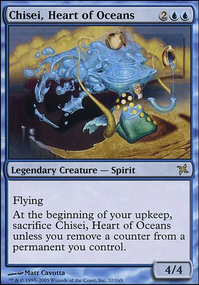 Additionally, a basic Counterspell can be less than a dollar depending on the version, and is another blue staple. I'm not too sure about Arcane Melee . It helps your opponents too, and you do not have that many instants and sorceries to benefit from it, especially since to cast it you would have most of the mana you'd need to cast the rest. As for creatures, they're just really expensive to cast. Quicksilver Amulet can help with that, but isn't really budget. Maybe a used copy? Light to moderate play cards are typically fine (by my standards) especially on a budget. Belbe's Portal naming whatever you have the most of in your hand could also be good, kinda-budget with a used copy, though it is an older card as well. Hmm.. Clone is also a versatile card to help with CMC issues. Overall, your deck seems good but slow. Which was your intention, but just be wary of aggro. Good Luck and take my advice with a grain of salt, I really enjoy combo decks and my playstyle is based on this. 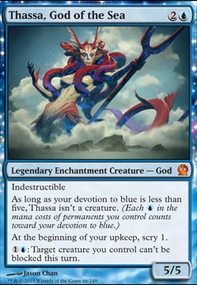 hungry000, I like your idea for mono blue Tron, the only problem is that a lot of my spells cost double blue and the tron lands only produce colorless manner. Maybe I should reevaluate putting some more counter spells in the main board. 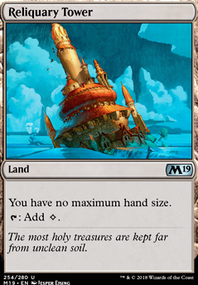 As for hitting my land drops, the amount of deck manipulation I have Throughs crying and drawing cards assures that I am almost never I am wanting for lands. Getting the eighth land for Stormtide Leviathancan be difficult sometimes, and even more so for Inkwell Leviathan, but if I’ve done my job well then I am typically lasting long enough to get to that point of casting them. Dete, Thanks for your suggestions! I like the idea of cryptic serpent, and it plays well with a lot of my other spells. I also like the idea of people from tomorrow; Jace’s ingenuity is the most affordable, best draw spell that I can think of. And at the rate of five man I am still drawing three cards but now I am discarding a card, and both are instant speed. I’ll think about it. Lastly my brothers... Don’t forget to upvote!